Over 600 people gathered to hear findings from "No Place Like Home," a two-year study about the affordable housing crisis in Santa Cruz. “I am hoping people will get organized – students and locals – to demand affordable housing,” shared a recent UCSC graduate who attended the event in a Dorothy costume. Photos by Melissa De Witte. 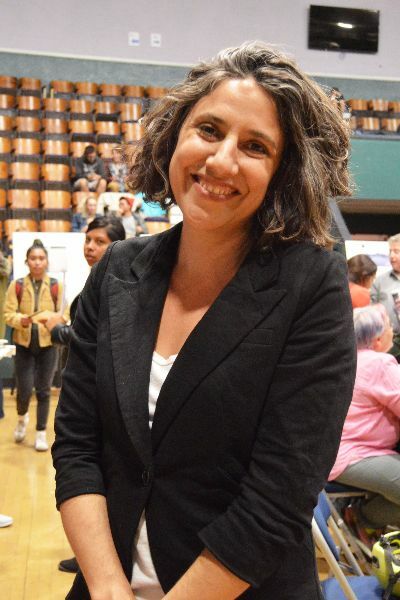 Sociology professor Miriam Greenberg co-led the study about the housing crisis in Santa Cruz. 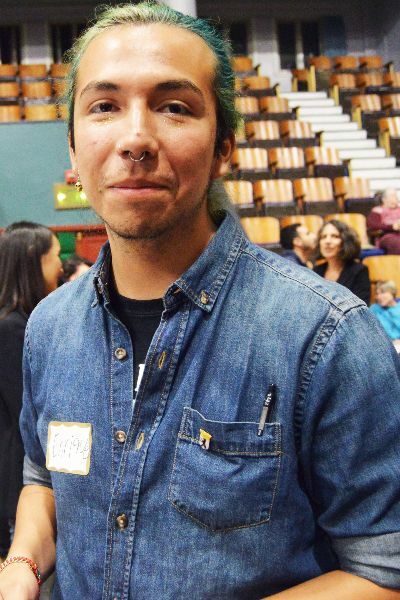 “This is the beginning of a new movement,” said Enrique, a sociology and community studies major at UC Santa Cruz who was tabling at the event on behalf of Students United with Renters, a new collaborative community group dedicated to housing justice. “Collectively as a community we have to have each other’s back,” said UC Santa Cruz professor Steve McKay to a packed Civic Auditorium in downtown Santa Cruz Oct. 19. Over 600 people gathered to hear findings from a study McKay and his colleague Miriam Greenberg led about housing in Santa Cruz - a place considered to be one of the least affordable places to live in the United States. For the past two years, the two sociology professors – joined by a team of 200 undergraduate students – gathered data about what living in Santa Cruz is really like. Greenberg and McKay collaborated with organizations that serve a diverse range of county residents, particularly some of the most vulnerable populations, including the Community Action Board of Santa Cruz County, Community Bridges, and California Rural Legal Assistance. “We’re all familiar with these statistics,” said Greenberg in her opening remarks about the existing data familiar to Santa Cruz residents: In 2016, the city ranked among the five least affordable markets in the nation, and census data reveals poverty is at an all-time high. “We can get caught up in [the statistics], overwhelmed by them, even paralyzed by them. We did this project because we felt numbers are not enough,” said Greenberg. “We wanted to understand broader questions: how are renters are experiencing this unprecedented situation? How are people creating home in a housing crisis? How can we understand the roots of the crisis, and possible responses to it?” Greenberg added. “We focused on renters as they represent 60% of Santa Cruz residents and 42% of county residents, and are among the hardest hit by the affordable housing crisis,” said McKay. ”Moreover, Spanish-speaking and low-income renters are often vulnerable, mobile and ‘difficult-to-reach’ populations that are often undercounted by the census and other surveys,” he added about their unique approach. Central to No Place Like Home was the participation of UC Santa Cruz students, said McKay. The project involved students with both the language skills and backgrounds in order to gather the highest quality of data. “Many of our students are bilingual Spanish speakers and first-generation college students, and many chose to participate in the project due to their own experiences with housing issues,” McKay added. Students visited flea markets, laundromats, mobile homes, and even rode city buses between Watsonville and Santa Cruz to capture responses. Their findings reveal many facets to the issue: extreme rent burdens, precarious living situations, forced moves, widespread displacement, and homelessness. “This is the moment when projects like this one can inform our decision makers and our debates, so that we can shape policy in ways that benefit the greatest number of people, and where we can launch discussions in a civil, respectful manner,” said dean of the Social Sciences Division Katharyne Mitchell who also spoke at Thursday’s event. For many, the event signaled the beginning of a new movement. It also kicked off Affordable Housing Week, a week of community events focused on finding solutions to housing issues. “This is the beginning of a new movement,” echoed Enrique, a sociology and community studies major at UC Santa Cruz (who asked for his last name to be withheld). Enrique was tabling on behalf of Students United with Renters, a new collaborative community group dedicated to housing justice. “I feel hope here,” said the student activist. “I am hoping people will get organized – students and locals – to demand affordable housing,” shared a recent UCSC graduate who prefered to be known only as Byers. 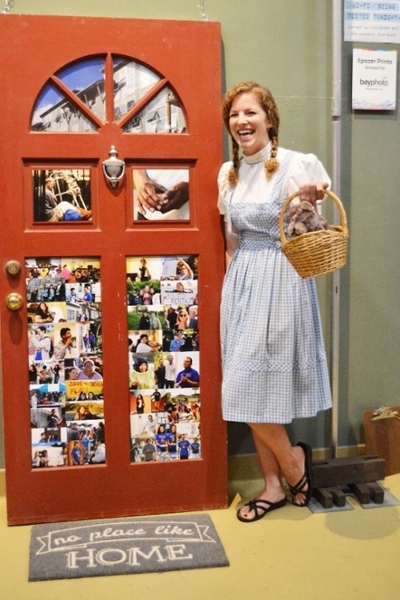 Byers attended the event in a Dorothy costume and said she hoped to raise awareness about current mobilization efforts in the community.